Since 1989, URETEK has put thousands of customers in complete control of their soil stabilization and concrete lifting problems- saving millions of dollars in costly repairs, downtime, and disruption. The URETEK story began in Finland in the 1970’s, where they began to research and test special formulations of high-density polymers. A limited number of specialized urethane components were selected from a wide cross section of possible blended characteristics. As a result, URETEK’s first line of polymer materials were formulated and selected for this unique system of lifting and under-sealing concrete. URETEK advanced the equipment technology of total proportion and injection control of the URETEK product. After years of development and research, The URETEK Method® became patented in the United States (U.S. Patent No. 4,567,708), and other countries around the world. URETEK USA, Inc. was granted the exclusive license rights for the sale of The URETEK Method® product and services in the United States and Mexico. Headquartered in Houston, Texas, the company served the department of transportation, cities, airport authorities, commercial, residential, and industrial customers throughout the United States. URETEK ICR was established to serve customers in the Industrial, Commercial, and Residential markets more effectively. URETEK created a licensing system to sell exclusive territories across the nation to start URETEK ICR businesses in the United States. 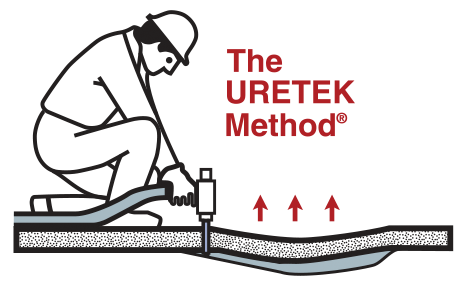 URETEK introduced The Deep Injection® Process, a proprietary system for increasing soil density and the load bearing capacity of foundation soils for pavements, slabs, and structures by injecting URETEK’s expanding polymers to depths from 3 feet to 30 feet and beyond. URETEK’s nationwide team members continue to bring industry leading URETEK repair technology to industrial, commercial, residential and industrial customers across the United States.